Girls in cheerleading don’t ever have problems finding the right gear for them to excel in their sport. But for other girls, like Riley who plays basketball, it’s not always that easy. When she wanted a pair of Curry 5’s she went online with her dad, only to find that they only had them in the boys’ section, not the girls. Encouraging her to write a letter, her dad posted it on Twitter and tagged the basketball star, Steph Curry. “I wanted to write the letter because it seems unfair that the shoes are only in the boys’ section and not in the girls’ section. I wanted to help make things equal for all girls, because girls play basketball, too.” Riley, interviewed in Teen Vogue. Curry’s response was awesome. 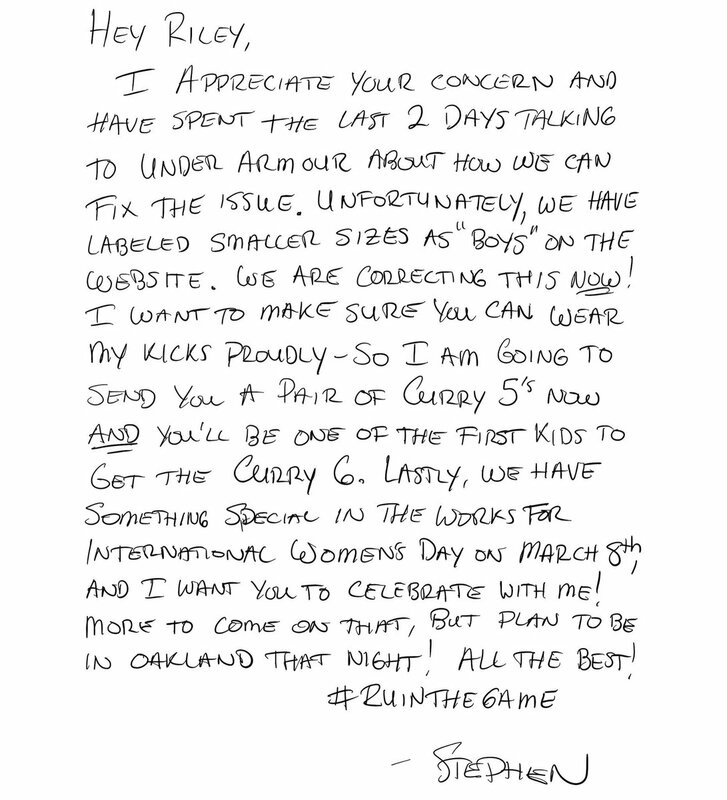 He not only got the Under Armor website to fix the issue of listing the smaller sizes of Curry 5’s only as boys’ shoes, but also invited Riley to a special event he’s hosting for International Women’s Day (March 8th). Steph Curry is known for his support of women’s rights and girls in sport, and hosts girls’ basketball camps. And his eldest daughter attends her dad’s post-game press conferences when she wants, making for some of the most adorable interviews ever!